Definition at line 82 of file audioengine.h. Definition at line 217 of file audioengine.h. Definition at line 216 of file audioengine.h. Definition at line 61 of file audioengine.cpp. Definition at line 66 of file audioengine.cpp. Definition at line 884 of file audioengine.cpp. Referenced by LLViewerObject::getAudioSource(), and triggerSound(). Definition at line 1131 of file audioengine.cpp. References LLAudioDecodeMgr::addDecodeRequest(), FALSE, gAudioDecodeMgrp, gAudiop, getAudioData(), LLAssetStorage::getErrorString(), llendl, llinfos, llwarns, mCurrentTransfer, LLUUID::null, LLAudioData::setHasDecodedData(), LLAudioData::setHasLocalData(), LLAudioData::setHasValidData(), startNextTransfer(), and TRUE. Definition at line 890 of file audioengine.cpp. References LLAudioSource::getID(), llendl, llwarns, and mAllSources. Definition at line 577 of file audioengine.cpp. References i, MAX_BUFFERS, mBuffers, NULL, and S32. Definition at line 845 of file audioengine.cpp. Definition at line 463 of file audioengine.cpp. References cleanupWind(), initWind(), and mEnableWind. Referenced by audio_update_volume(), setMuted(), and toggle_wind_audio(). Definition at line 851 of file audioengine.cpp. Definition at line 867 of file audioengine.cpp. Referenced by assetCallback(), LLAudioSource::play(), preloadSound(), process_preload_sound(), and LLAudioDecodeMgr::Impl::processQueue(). Definition at line 810 of file audioengine.cpp. Definition at line 788 of file audioengine.cpp. Definition at line 478 of file audioengine.cpp. References createBuffer(), i, llendl, llinfos, LLAudioBuffer::mAudioDatap, MAX_BUFFERS, LLAudioData::mBufferp, mBuffers, NULL, and S32. Definition at line 522 of file audioengine.cpp. References LLAudioChannel::cleanup(), createChannel(), LLAudioSource::getPriority(), LLAudioChannel::getSource(), i, mChannels, mNumChannels, NULL, S32, and LLAudioSource::setChannel(). Referenced by idle(), and LLAudioSource::setupChannel(). Definition at line 633 of file audioengine.cpp. Definition at line 143 of file audioengine.h. Definition at line 146 of file audioengine.h. Definition at line 742 of file audioengine.cpp. References LLListener::getPosition(), mListenerp, and LLVector3::zero. Definition at line 628 of file audioengine.cpp. Definition at line 111 of file audioengine.h. Referenced by idle(), and startNextTransfer(). Definition at line 832 of file audioengine.cpp. Definition at line 904 of file audioengine.cpp. References FALSE, LLDir::fileExists(), gDirUtilp, LLDir::getExpandedFilename(), LL_PATH_CACHE, LLUUID::toString(), TRUE, and UUID_STR_LENGTH. Referenced by LLAudioDecodeMgr::addDecodeRequest(), LLAudioData::LLAudioData(), and LLAudioDecodeMgr::Impl::processQueue(). Definition at line 924 of file audioengine.cpp. References LLAssetType::AT_SOUND, LLVFS::getExists(), and gVFS. Definition at line 165 of file audioengine.cpp. References commitDeferredChanges(), default_max_decode_time, f, FALSE, gAudioDecodeMgrp, LLAudioSource::getChannel(), getFreeChannel(), getMasterGain(), getMuted(), i, LLAudioChannel::isPlaying(), LLAudioSource::isSyncSlave(), mAllSources, MAX_BUFFERS, MAX_CHANNELS, mBuffers, mChannels, LLAudioChannel::mLoopedThisFrame, NULL, LLAudioChannel::playSynced(), LLAudioDecodeMgr::processQueue(), S32, LLAudioSource::setChannel(), setInternalGain(), LLAudioChannel::setWaiting(), startNextTransfer(), TRUE, LLAudioChannel::updateBuffer(), updateBufferForData(), and updateChannels(). Referenced by idle(), and LLAudioEngine_FMOD::idle(). Definition at line 71 of file audioengine.cpp. References allocateListener(), FALSE, gAudioDecodeMgrp, i, MAX_BUFFERS, mBuffers, mChannels, mEnableWind, mInternetStreamGain, mLastStatus, mMasterGain, mMaxWindGain, mMuted, mNumChannels, mUserData, NULL, S32, and TRUE. Referenced by idle_startup(), and LLAudioEngine_FMOD::init(). Definition at line 184 of file audioengine.h. Referenced by LLOverlayBar::enableMusicButtons(), and LLAudioStreamMusicListener::handleEvent(). Definition at line 609 of file audioengine.cpp. Definition at line 644 of file audioengine.cpp. Definition at line 687 of file audioengine.cpp. References F_PI, LLVector3::normVec(), and LLVector3::setVec(). Definition at line 663 of file audioengine.cpp. Definition at line 767 of file audioengine.cpp. Definition at line 591 of file audioengine.cpp. References LLAudioDecodeMgr::addDecodeRequest(), FALSE, gAudioDecodeMgrp, gAudiop, getAudioData(), and TRUE. Referenced by init_audio(), and LLPreviewSound::LLPreviewSound(). Definition at line 801 of file audioengine.cpp. Definition at line 779 of file audioengine.cpp. Referenced by idle(), and setMasterGain(). Definition at line 145 of file audioengine.h. Referenced by audio_update_volume(), and LLAudioEngine_FMOD::setInternetStreamGain(). Definition at line 773 of file audioengine.cpp. Referenced by audio_update_listener(), and init_audio(). Definition at line 736 of file audioengine.cpp. Definition at line 755 of file audioengine.cpp. Definition at line 622 of file audioengine.cpp. Definition at line 638 of file audioengine.cpp. Definition at line 615 of file audioengine.cpp. Referenced by audio_update_volume(), and idle_startup(). Definition at line 823 of file audioengine.cpp. Referenced by audio_update_volume(), and audio_update_wind(). Definition at line 105 of file audioengine.cpp. References gAudioDecodeMgrp, i, mAllData, mAllSources, MAX_BUFFERS, MAX_CHANNELS, mBuffers, mChannels, NULL, and S32. Referenced by cleanup_app(), and LLAudioEngine_FMOD::shutdown(). Referenced by LLAudioStreamMusicListener::handleEvent(), LLOverlayBar::musicPlay(), and LLViewerParcelMgr::processParcelProperties(). Definition at line 931 of file audioengine.cpp. References assetCallback(), LLAssetType::AT_SOUND, f, gAssetStorage, gAudiop, LLAssetStorage::getAssetData(), LLAudioSource::getCurrentData(), LLAudioData::getID(), getMuted(), LLAudioSource::getPriority(), LLAudioSource::getQueuedData(), LLAudioChannel::getSource(), LLAudioData::hasLocalData(), LLAudioData::hasValidData(), i, LLUUID::isNull(), llendl, llinfos, mAllSources, MAX_CHANNELS, mChannels, mCurrentTransfer, mCurrentTransferTimer, LLAudioSource::mPreloadMap, LLUUID::notNull(), NULL, LLFrameTimer::reset(), and S32. Referenced by LLAudioSource::addAudioData(), assetCallback(), and idle(). Referenced by LLAudioStreamMusicListener::handleEvent(), LLOverlayBar::musicStop(), and LLViewerParcelMgr::processParcelProperties(). Definition at line 761 of file audioengine.cpp. Definition at line 708 of file audioengine.cpp. References addAudioSource(), gAudiop, LLUUID::generate(), LLVector3d::isExactlyZero(), mMuted, LLAudioSource::play(), LLAudioSource::setAmbient(), LLAudioSource::setPositionGlobal(), TRUE, and LLAudioSource::updatePriority(). Referenced by add_object(), LLPreviewSound::auditionSound(), LLViewerTextEditor::openEmbeddedSound(), process_sound_trigger(), ui_audio_callback(), and LLVOAvatar::updateCharacter(). Definition at line 429 of file audioengine.cpp. References LLAudioDecodeMgr::addDecodeRequest(), FALSE, gAudioDecodeMgrp, LLAudioData::getBuffer(), LLAudioData::hasDecodedData(), LLAudioData::hasLocalData(), LLAudioData::load(), LLUUID::notNull(), and TRUE. Referenced by idle(), and LLAudioSource::play(). Definition at line 150 of file audioengine.cpp. References i, MAX_CHANNELS, mChannels, S32, LLAudioChannel::update3DPosition(), and LLAudioChannel::updateLoop(). Definition at line 185 of file audioengine.h. Definition at line 166 of file audioengine.h. Definition at line 220 of file audioengine.h. Referenced by getAudioData(), and shutdown(). Definition at line 219 of file audioengine.h. Referenced by addAudioSource(), cleanupAudioSource(), findAudioSource(), idle(), LLPipeline::postSort(), shutdown(), and startNextTransfer(). Definition at line 226 of file audioengine.h. Referenced by cleanupBuffer(), getFreeBuffer(), idle(), init(), and shutdown(). Definition at line 222 of file audioengine.h. Referenced by getFreeChannel(), idle(), init(), shutdown(), startNextTransfer(), and updateChannels(). Definition at line 210 of file audioengine.h. Referenced by assetCallback(), and startNextTransfer(). Definition at line 211 of file audioengine.h. Definition at line 208 of file audioengine.h. Referenced by enableWind(), init(), isWindEnabled(), and LLAudioEngine_FMOD::updateWind(). Definition at line 231 of file audioengine.h. Referenced by getInternetStreamGain(), init(), LLAudioEngine_FMOD::setInternalGain(), setInternetStreamGain(), and LLAudioEngine_FMOD::updateInternetStream(). Definition at line 205 of file audioengine.h. Definition at line 200 of file audioengine.h. 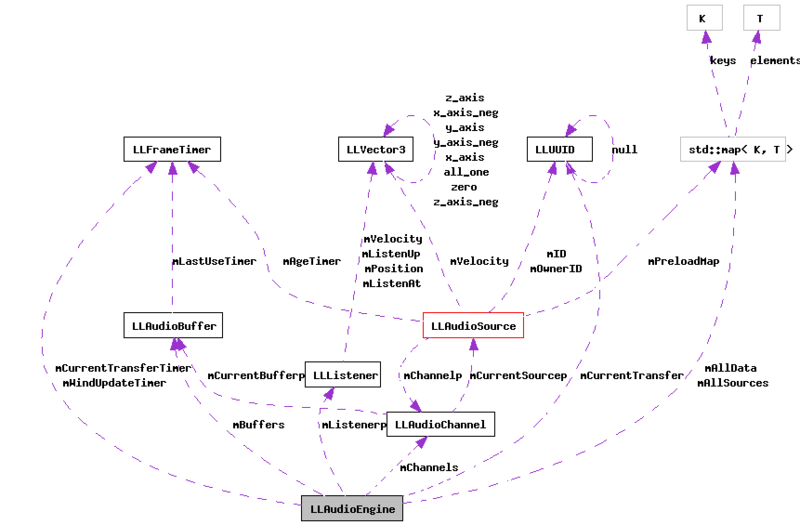 Referenced by LLAudioEngine_FMOD::allocateListener(), commitDeferredChanges(), getDistanceFactor(), getDopplerFactor(), getListenerPos(), getRolloffFactor(), orientListener(), setDistanceFactor(), setDopplerFactor(), setListener(), setListenerPos(), setListenerVelocity(), setRolloffFactor(), LLAudioEngine_FMOD::shutdown(), and translateListener(). Definition at line 228 of file audioengine.h. Referenced by getMasterGain(), init(), and setMasterGain(). Definition at line 168 of file audioengine.h. Referenced by audio_update_wind(), init(), setMaxWindGain(), and LLAudioEngine_FMOD::updateWind(). Definition at line 202 of file audioengine.h. Referenced by getMuted(), init(), setMuted(), and triggerSound(). Definition at line 233 of file audioengine.h. Definition at line 207 of file audioengine.h. Referenced by getFreeChannel(), and init(). Definition at line 203 of file audioengine.h. Definition at line 235 of file audioengine.h.